Can you dry up oily skin, help minimize the appearance of dark spots, slow the appearance of aging, and protect your inner sun goddess, all with one natural ingredient? If you’re talking about turmeric, the answer is yes. Turmeric has been considered an important part of Indian culture for at least 4000 years. It is regularly used as a spice for traditional dishes, as a medicine, and as a dye that offers a pretty yellow-orange color. As part of religious tradition in both Buddhism and Hinduism, turmeric is used to anoint the statues of deities and to represent purity in important ceremonies like marriage and birthing. It was one of the first and most important spices in the Silk Road spice trade and because of its widespread use it has over 50 names in Sanskrit and is known all around the world by many more. Most commonly it’s known by its Latin name, curcuma. This can be tricky because there are over 100 curcuma plants worldwide and most of them are known locally, grow in rainforest climates, and have similar medicinal uses but the turmeric that think of is Curcuma longa. 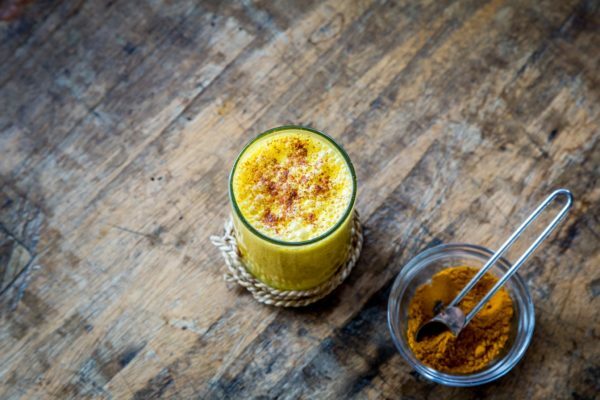 Though this relative of ginger has been around for thousands of years, turmeric has enjoyed renewed popularity thanks to recent research confirming that it’s health benefits are nothing short of amazing. Along with being abundant and delicious, taking curcuma internally on a consistent basis is great for long term nourishment of the cardiovascular and digestive system. The traditional peoples know this, and that’s why it’s used in so many foods – and eating it with a little bit of black pepper makes it even more effective. Modern medicine has embraced turmeric, with over 3,000 publications mentioning the root over the past 25 years because of an active constituent in turmeric called curcumin. The studies have shown that curcumin, when eaten on a consistent basis, may increase circulation, prevent blood clots, ease joint pain, delay the onset of type 2 diabetes, and help to improve memory in dementia patients. Turmeric has been used in Ayurvedic medicine for the kapha/vata type and is known as a gentle liver stimulating herb so it’s indicated for headaches that are caused by liver stagnation (bilious headaches), and for people that are sensitive to fatty food. Turmeric is inexpensive, obtainable and it’s a powerhouse of an herb, so we think that it’s worth adding a little bit to your dinnertime spice blend. Even though it isn’t something that will make an immediately noticeable change to your health, consistent use and extractions are contraindicated for people that are already taking blood thinning medications, have clotting disorders, or have a surgery in the near future. Turmeric has natural oil-controlling properties overtime! If you’re working with oily skin and clogged pores, try adding turmeric extract to your homemade masks. If you’re using the powder, be sure to mix it with other ingredients because it can leave a yellow stain on your skin if you’re using it for a long time on its own. Turmeric contains potent antioxidants known to protect against environmental stressors. With it’s internal benefits being so amazing, it makes sense that topical application of turmeric may also help delay the appearance of aging on the skin. Natural sun worshippers can totally resonate with this one, we’re all tired of those dark spots! Turmeric is an ancient beauty ritual for lightening and brightening the skin. Turmeric water was traditionally used to wash with every day for the illuminating effect. Turmeric is such a gentle ally that it’s great to use for sensitive skin too. It is soothing to reactive, delicate skin while also being mineral and antioxidant rich and providing nourishment for that sensitive skin that needs a bit of extra love. Making a mask with turmeric is easy! We suggest mixing your powdered turmeric with other ingredients because using it by itself can leave a short-term stain on your skin. Since Curcuma longa is amazing for any type of skin, we want to offer a mask recipe here that anyone can do but you we encourage you to add turmeric to any type of homemade mask! You just want to make sure that you’re choosing the right facial mask for your skin type. Mix these together well and apply it to a clean face. Leave for 15-30 minutes and rinse using warm water or a washcloth. Note: turmeric will stain fabric, so we suggest wearing an old shirt and drying with an old towel. What’s your Favorite Way to Use Turmeric? Share your recipe below! “‘Curry' Cream May Fade Wrinkles.” WebMD. WebMD, n.d. Web. 25 Jan. 2017. Hobbs, C., & Gardner, L. (n.d.). Grow it, heal it: Natural and effective herbal remedies from your garden or windowsill. Prasad, Sahdeo. “Turmeric, the Golden Spice.” Herbal Medicine: Biomolecular and Clinical Aspects. 2nd edition. U.S. National Library of Medicine, 01 Jan. 1970. Web. 25 Jan. 2017. “The Religious Significance of Turmeric.” Our Everyday Life. N.p., n.d. Web. 25 Jan. 2017. Can i add fresh grinded turmeric root in my cream and apply on my body and face??? Absolutely! Turmeric is safe and effective to apply topically. WOW! From this wonderful article and all the great comments, I had no idea that turmeric is such a beneficial substance. I need to do more heavy research, but thank you, and all those who have commented, so much for sharing all this valuable information. I make soap and other bath and body products. This is definitely an eye-opener for me to investigate more thoroughly. Thank you so much for helping me to learn even more! Will definitely be trying tumeric! Do you have any recipes of how to make a cream? I’ve battled acne for three decades. I’ve created a turmeric mixture that has worked wonders: 1 tsp organic turmeric powder, 1 tbls plain organic yogurt, half tsp baking soda, half tsp apple cider vinegar, 1 tsp powered vitamin c. Mix well and apply to face and neck. Leave on til completely dry. I’m not a doctor and I don’t recommend this to anyone– however, this works for me. Would’ not the cream clog the pours? It seems like an absolute miracle herb. What about taking it in capsule form? Do you have that product available? I need to go back and re read what ingredients your mask contains? it sounds like Curcumin would be a great choice. I have many of the problems that you mentioned in which Curcumin would be a great option for me. Please let me know if there are any benefits taking the capsule orally. isn’t it going to color your skin bright orange? I use it fresh roots for cooking and it takes days to get the color out from the cutting boards and such. We use a gram flour turmeric and yogurt paste during bath sometimes to remove tan and nourish the skin. Also oatmeal turmeric and yogurt works.Note that one needs to only use half a teaspoon of turmeric.Not too much. Do you have a face cream containing turmeric? I love turmeric for face masques. I use turmeric and baking cocoa (another powerful antioxidant in a base of mashed banana, mashed avocado or plain Greek yogurt. I also make a powder of equal parts turmeric, cocoa and baking soda which I mix with my facial cleanser to brighten and exfoliate. This has greatly reduced my hyperpigmentaion (age spots) and wrinkles. Be careful to keep these mixtures off of clothing or nice washcloth and towels. Turmeric stains!